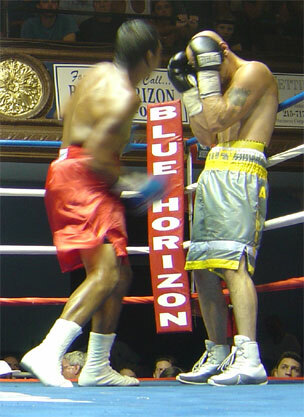 Harry Joe Yorgey made a successful return to the Blue Horizon with a unanimous 8-round decision over Edson Aguirre in the main event on Friday night at the sweltering Blue Horizon. 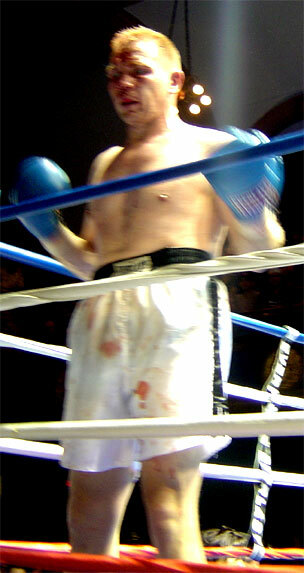 The sweat was really flying on North Broad Street - and not just in the ring. The crowd rooted for knockouts, hoping to get back to their air-condition cars but KOs proved to be hard to come by in the nine bout show. With his usual large cheering section on hand - led by his shadow-boxing father, Yorgey used constant pressure and clean punching to gain the edge in most of the action against his Greensboro, NC foe. Aguirre let numerous booming shots go throughout the bout, but he mostly missed and Yorgey had the best of it all the way. In fact, on the official tallies, the best Aguirre did was win 2 rounds on one of the judge's card. At the end, the cards read 80-72, 79-73 & 78-74. Dave Brunelli was the better conditioned heavyweight in his 6-rounder against Aaron Lyons - and it served him well in the 100-plus degree arena. Lyons looked pooped after a round or two and Brunelli stepped on the gas as best he could in the oppressive heat. Brunelli cut his opponent over the left eye in round two and then had him wobbly in round three. But Lyons fought back and hurt Brunelli, in the third too. However, after that, Lyons seemed exhausted, and Brunelli took the rest of the rounds and coasted to the easy decision. The win upped Dave's record to 7-2 while Lyons dropped to 5-1. Henry Lundy pushed his pro record to 6-0 and looked like a fighter to watch with his 4-round unanimous decision win over a very experienced Reggie Sanders, now 12-40-4. It was an excellent action fight with both boxers in perpetual motion. But it was Lundy's fight, as he won all the rounds and even dropped Sanders in the third. The final scores were 40-35, 40-34 & 40-35. In a 4-round women's welterweight bout, Akima Stocks spoiled the pro debut of Philly's Michelle Garland. The two clashed heads in round one and Garland bled freely for the remainder of the fight. It was clear that the blood-flow had her distracted and it appeared to me that she was ready to quit. The fight went a full two rounds but was declared a No Decision between the second and third rounds. Garland, the sister of slain boxer William Boggs, now has a record of 0-0-0 with 1 ND. Stocks remains 1-0-0 but adds her first NC to her slate. 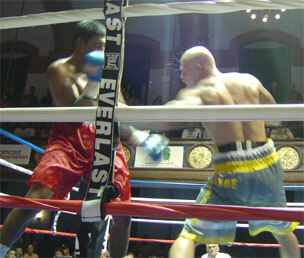 Light heavyweights Jacob Rodriguez and Juergan Hartenstein also clashed heads early in their 4-round bout. Hartenstein came away with the damage and bled from round one through about two minutes of the fourth. At that point, the ring doctor suggested a stoppage, forcing an early read of the cards. To no surprise, Rodriguez took the technical decision unanimously with 40-36 scores all around. 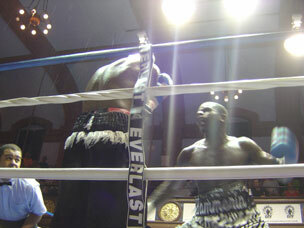 Lightweights Bryheim Douglas and Mondre Pope fought to a majority 4-round draw. Douglas had the edge on one card but the other two judges saw the action deadlocked. Najee Murray opened the show with a unanimous decision in his pro debut over Jason Collazo. Murray dropped his opponent once in the third and then again in the fourth. Middleweight Murray went to 1-0 while Collazo fell to 0-2. The KOs finally came in the walk-out bouts. First jr. middleweight Derek Ennis TKO'd Mike McGuire in the first round of a scheduled 6-rounder. 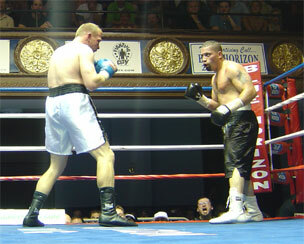 The win moved Ennis to 12-1-1 with 9 KOs, while McGuire, from Topeka, KS, dropped to 5-17-1 (2 KOs). In the final fight of the night, Newark's Faruq Saleem KO'd Wallace McDonald in the very first round of 6-round heavyweight fight. Saleem went home with a 36-0 (31 KO) record, and McDaniel'd record now reads 8-18-1 (4 KOs). It was a pretty good crowd for such a hot night. The attendance was probably about 1,000. Ringside celebs included Michael Spinks, Butch Lewis, Harold Letterman, Max Alexander, Tommie Speller, Tex Cobb, Mark 'Oak Tree' Brown, and Anthony Thompson. The next show at the Blue Horizon is scheduled for September 9th.